VG5Q functions as an angiogenic factor in promoting angiogenesis and suppression of VG5Q expression inhibits vessel formation. Angiogenic factors are critical to the initiation of angiogenesis and maintenance of the vascular network. Angiogenesis has an essential role in pathological conditions such as cancer and various ischaemic and inflammatory diseases. VG5Q can bind to endothelial cells and promote cell proliferation, suggesting that the protein may act in an autocrine fashion. VG5Q interacts with TWEAK (also known as TNFSF12), another secreted angiogenic factor. VG5Q shows strong expression in blood vessels and is secreted when vessel formation is initiated. VG5Q protein was detected mostly in the cytoplasm and around the nuclei of human microvascular endothelial cells (HMVECs). Furthermore VG5Q is detected in human umbilical vein endothelial cells (HUVECs), human heart fibroblast (HHF) and ovarian cancer cells (OV-3), but low expression was detected in kidney cancer cells (RP-45), HeLa Cells and bladder cancer cells. 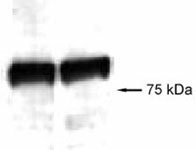 Western Blot analysis of AGGF1 expression in transfected 293T cell line (H00055109-T02) by AGGF1 MaxPab polyclonal antibody.Lane 1: AGGF1 transfected lysate(78.54 KDa).Lane 2: Non-transfected lysate. AGGF1 MaxPab polyclonal antibody. Western Blot analysis of AGGF1 expression in HeLa. 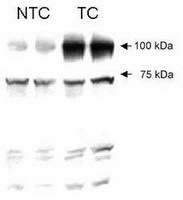 Western Blot analysis of AGGF1 expression in transfected 293T cell line (H00055109-T03) by AGGF1 MaxPab polyclonal antibody.Lane 1: AGGF1 transfected lysate(78.54 KDa).Lane 2: Non-transfected lysate. Western Blot analysis of AGGF1 expression in transfected 293T cell line (H00055109-T03) by AGGF1 MaxPab polyclonal antibody.Lane 1: AGGF1 transfected lysate(80.90 KDa).Lane 2: Non-transfected lysate. Western blot analysis of Aggf1 in mouse skin protein extracts using Aggf1 polyclonal antibody ( Cat # PAB12151 ). 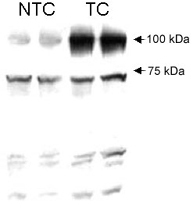 Human AGGF1 detected in HT1080 non-transfected cell lysate ( NTC ) and HT1080 transfected cell lysate ( TC ) using AGGF1 polyclonal antibody ( Cat # PAB12494 ). Human VG5Q detected in HT1080 non-transfected cell lysate (NTC) and HT1080 transfected cell lysate (TC) using anti-VG5Q.